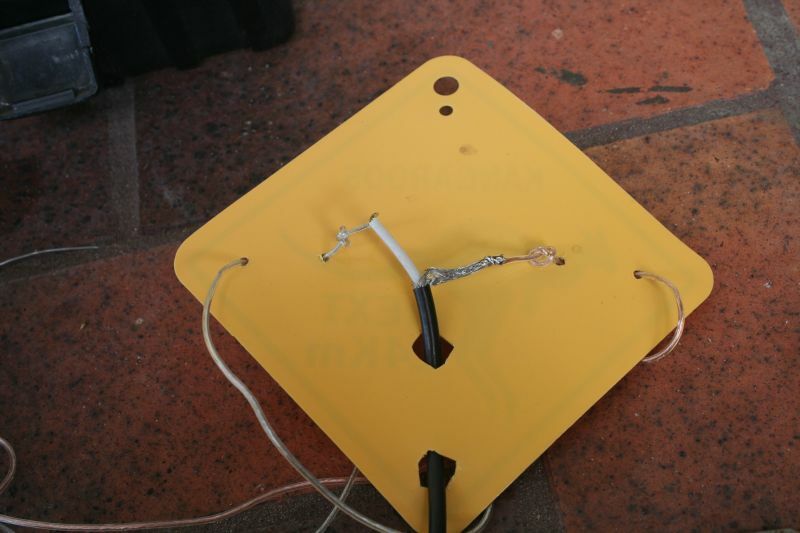 The dipole was made using a square shaped plastic souvenir mini road sign (Kangaroo warning) as the centre insulator, a 10m reel of speaker wire from a consumer electronics shop, RG58 coaxial cable and a connector for the radio. It was held up in the air by a telescopic fibreglass pole (squid pole). Holes were cut in the insulator to protect the connections from stresses. I did not have a drill so I used a hobby knife. 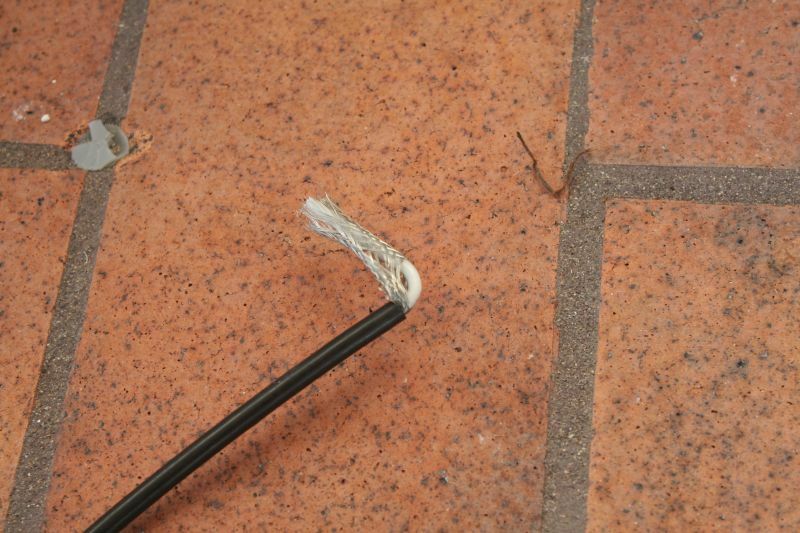 The coaxial cable was prepared by removing the outer insulation, then sliding the braided shield wire down the inner insulation, exposing a gap in the braid and feeding the inner conductor through the gap. This allows the braid to remain braided giving it strength and form that is lost if it is combed out as a multi strand conductor. The antenna wires and coax were routed through the holes in the insulator, then soldered together. 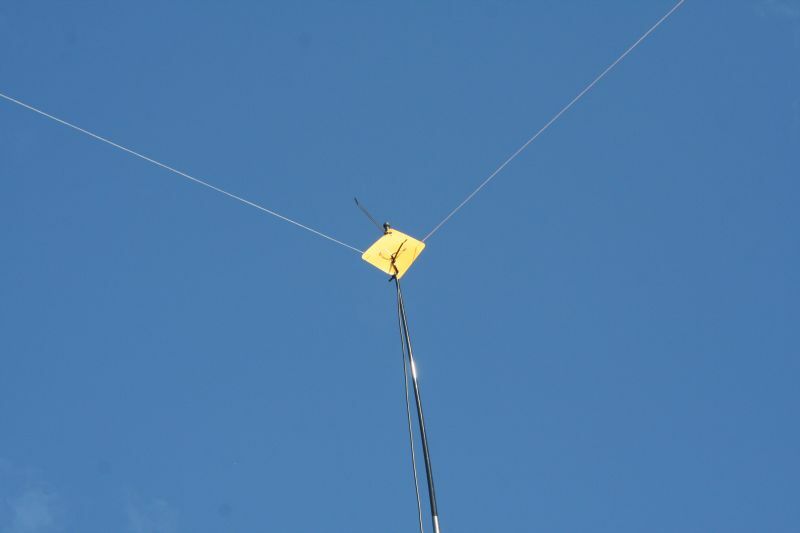 The antenna was lifted into the air, cords were attached to the dipole ends and tied off. The length of the antenna may need to be adjusted by folding it back on itself. This prevents/avoids cutting it and having to add some when too much is cut off. 300/7.1 gives the wavelength in metres, each side of a half wave dipole should be a quarter of that length, less the end correction factor of 3 to 5%. In the location this was originally built for, the dipole sides were only separated by 90 degrees due to space restrictions. I did work a few stations in VK and JA using this antenna on 40m and 30m. CW.